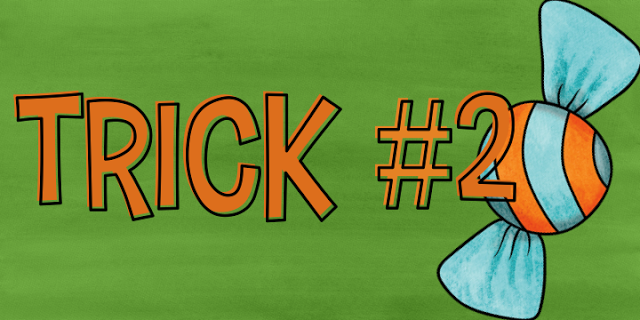 One of the most unique things about teachers is that we come up with some pretty genius tricks and hacks for the classroom. Using shower curtain rods to hang anchor charts, building seats out of plastic crates. You name it, a teacher has probably tried it. Now I’m usually the one who sees pictures of a classroom trick and thinks, “wow, that’s absolutely genius! Why didn’t I think of that?” and not the one actually thinking on my toes to solve a minor problem. 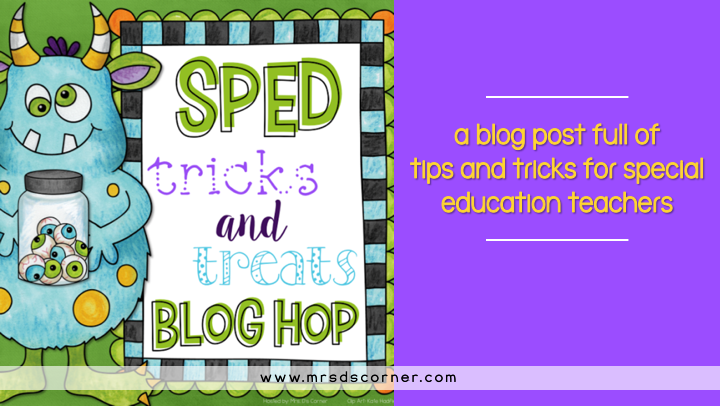 But today I am sharing three different special ed tricks with you to help keep your classroom running smoothly and safely. Behold the magic, hanging the poop can spray. 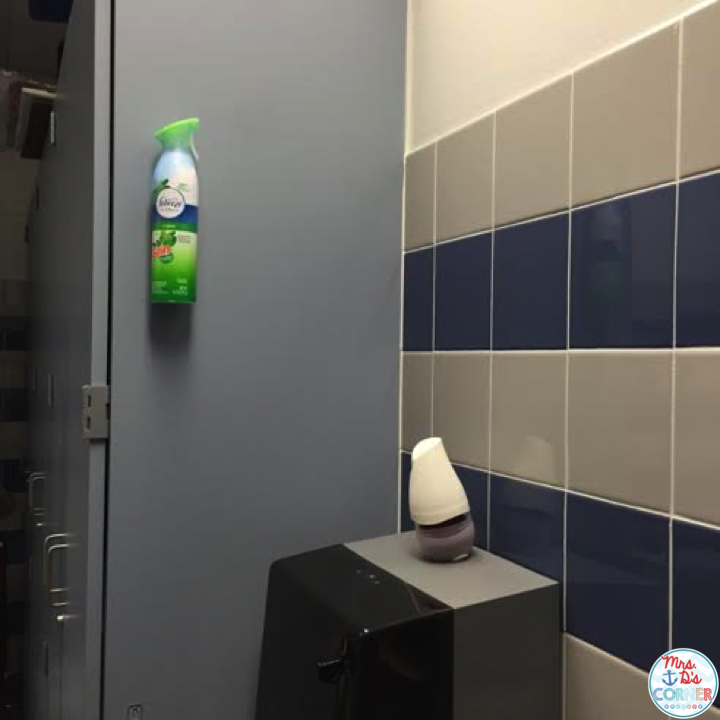 Since I have a bathroom in my classroom, it *sometimes* stinks. You can shut the door, but when you walk in to change a student… WOOOF! I used to let the spray sit on top of the paper towel dispenser, but every time someone pulled the lever to get a paper towel, it would slide down and fall into the trash can below it. Not cool! I’ve lost many a bottle of spray this way. Enter Velcro, ya know, a special ed teacher’s best friend and sidekick. 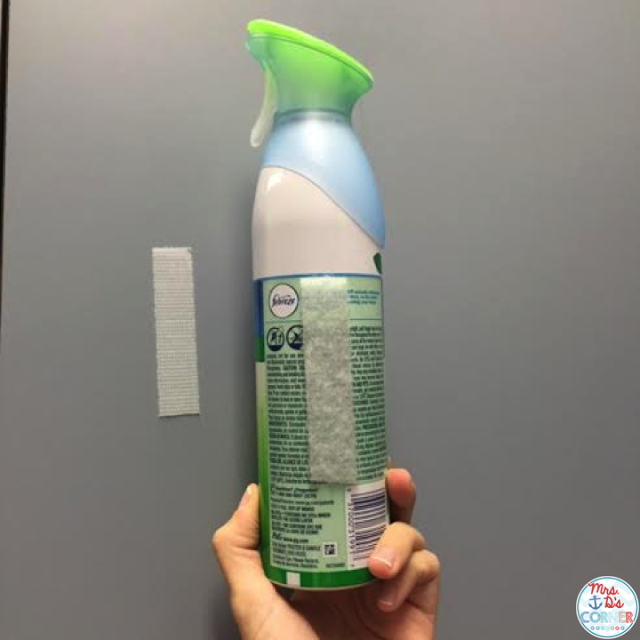 Not only has this bottle of spray lasted my classroom months on end, it is now out of reach of my students. Not that I feel like they’d waste it, but for safety reasons I know now that I can send a student in the bathroom independently and not worry about them getting spray in their eyes or something. I was also having a small issue with our boxes of gloves. Some of you might be lucky enough to have glove dispensers hanging on your wall, but not me. You can kind of see in the bottom left of the picture above that the changing table is there. Well the gloves used to sit in that corner on the changing table and get in the way. They’d end up on the floor or behind the table… it just wasn’t working. Add a few strips of Velcro and my problem is solved! Now when a box is empty, I just need to add a strip of Velcro and them slap it onto the wall. If the box is a little heavier, I might add two strips. In all honesty, I can’t take credit for this last sped trick. You can all thank my amazing OT who showed me, but it blew my mind so I wanted to share it with you. If you have students whose feet don’t yet touch the floor (we use big blocks of foam under our feet to stabilize us) and because of this, they slide out of their chair or kind of slouch down… try this! Cabinet shelf liner. Yep, the stuff you might use in your kitchen or bathroom cabinets to keep your dishes or stuff from sliding around. Cut a piece to fit on the chair and then the student sits on top of it. No more slipping around in the chair. 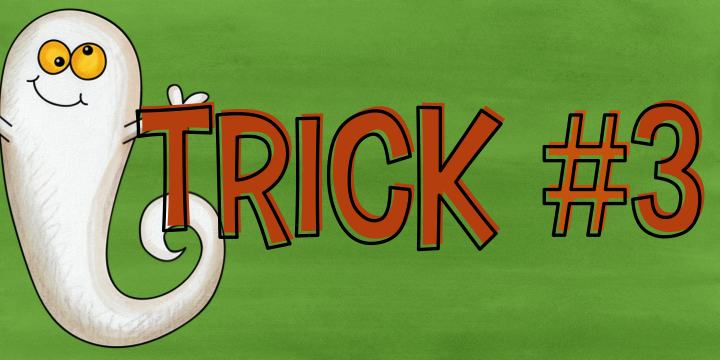 Now that you’ve found out all of my classroom tricks, it’s time for a treat! 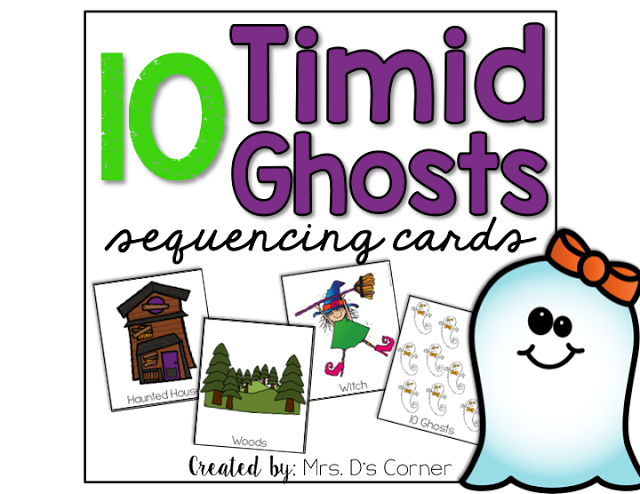 One of my favorite Halloween books to read each October is Ten Timid Ghosts. It’s repetitive and fun for the kids as the silly witch tries to get these ghosts out of her new house. We read this story a few days ago when we have a few free minutes before going to inclusion. The following week, at the first grade team meeting, they talked about how they’d be using this book in the upcoming week. Since many of my students have IEP goals on sequencing events in a story, it gave me an idea to create sequencing cards for my students. Brilliant, right?! Not only do my students benefit, now you do too! 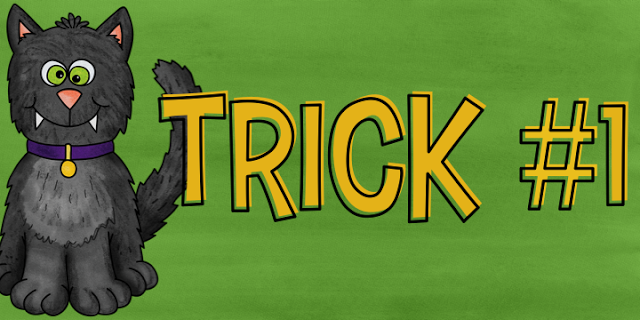 What tricks do you use in your classroom? Tell us in the comments below! Just when I thought I knew every Velcro trick!!! 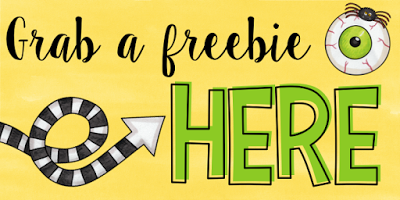 Love all of your tricks and a great freebie!! 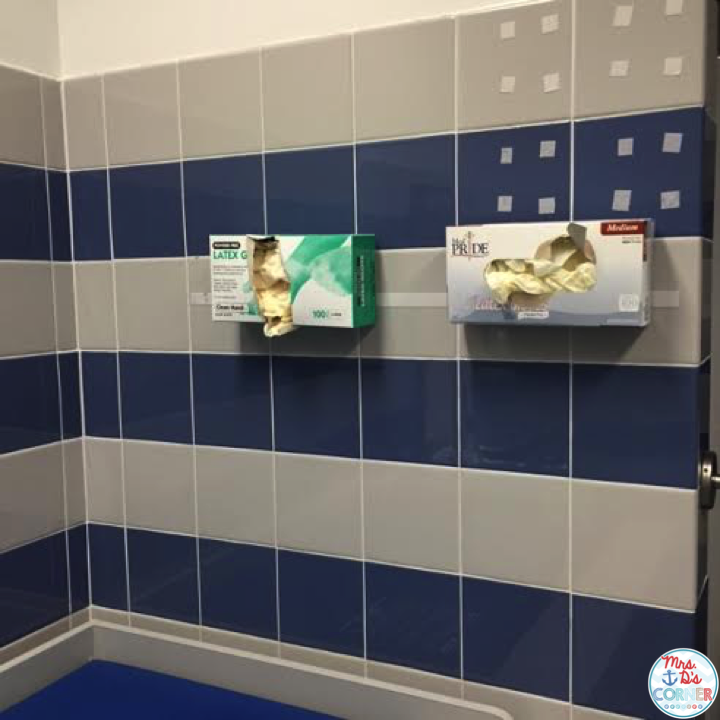 A bathroom in your classroom? Girl, you're lucky! I had to turn an adult bathroom around the corner into our class bathroom. Love your tips, I will so use them in my makeshift toilet training bathroom! Great tips! I never thought of using velcro on air freshener to keep it handy and out of reach! Thanks for sharing! 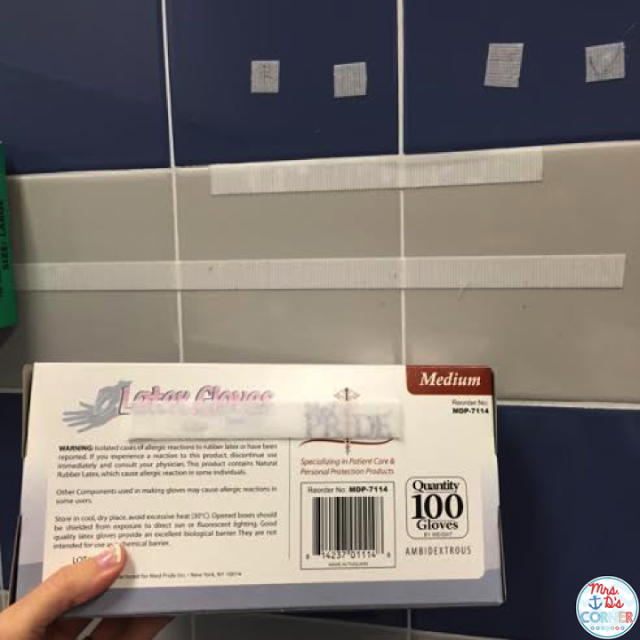 Love all the ideas for velcro! They will definitely come in handy! I love Velcro. It has so many great uses. Thanks for giving me a few more ideas. LOL your trick. I had to read "hanging poop can spray" multiple times before I understood. TOO FUNNY! And Velcro is simply amazing for EVERYTHING!! !